Spring’s a great time to support yourself in the renewal taking place in and around you. It's time for letting go of what is not working for you or bogging you down. The lymphatic system and your skin are working hard to slough off the layers of winter; a professional facial is a great way to deeply release and replenish that your beautiful working organ. I hear your brain right now ... " I don't have time to book a facial. " If that's the case, then let's chat real quick about the best two part skin ritual to add right now as we transition seasons. I know, in a new age of beauty, women like you want to know what's in the bottle and that it meets the standards of being solution based and effective. Like you, I love the science of skin care ingredients, and today I'm briefing VITAMIN C - and what to look for. Vitamin C - The debrief. First thing first.Before you reach for any product, make sure you're getting the BIG C in your diet! Our body and skin have certain enzymes such as superoxide dismutase and glutathione peroxidase. These protective systems also include plenty of antioxidants, including vitamins C and E.
These foods make their way from your digestive system, to your blood supply, and from there to the tiny blood vessels that supply your skin. They then diffuse into the epidermis and dermis, where they protect your skin from free radicals. That's the "inside-out" approach, now here's the critical part to know when applying vitamin C to the outer. Just because it contains vitamin C, doesn't mean that it will be effective. Vitamin C is a water-soluble molecule, and your skin barrier is meant to repel water. This is why I invest in cell deep LIPOSOMAL Vitamin C Ester in each Evoq formula. These are fatty acids that are bioavailable to enter your cellular matrix for high efficacy and performance. Great question!Vitamin C is a sure bet to quickly oxidize. In the presence of light, heat, and even oxygen, vitamin C quickly starts to destabilize, turning your high price investment into something far less effective. IN FACT, some researchers are even concerned that an unstable vitamin C molecule can actually create MORE skin damage. So, how do you protect your invested Vit-C? Opt in for lipid based vitamin C. Next, make sure the product is protected from light, heat, and oxygen. Unlike most exfoliation products on the market, Evoq's Sea Pearl Polish will not damage delicate capillaries and pores and is completely safe to use on a daily basis if needed. I took rich sea pearls and incorporated them into a blend of isotonic sea water, food grade algae and aloe vera gel to help soothe and protect the skin. FYI: Abrasive walnut and apricot exfoliators tear the skin, leaving your barrier leaking it's hydration and damaged over time. Simply mask for 5-10 minutes, then gently scrub with your fingertips in a circular motion and to let the rich algae base do the work – in other words, no need to exert a lot of pressure. RINSE! With just a few drops, restore firmness and reveal glowing skin with Vitamin C Esters that repair cells, brighten dullness, and eliminate dark spots. Botanical Stem Cells of Narcissus and Madonna Lily- Reduce skin discoloration by inhibiting the transfer of melanosomes, which can create dark spots. 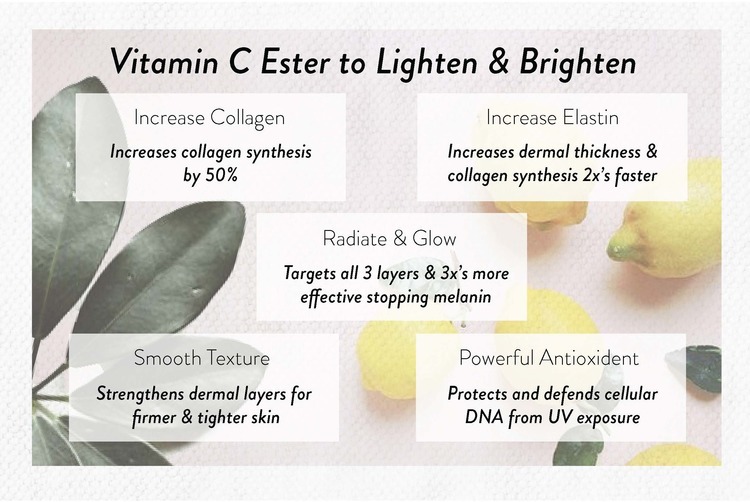 Vitamin C Esters- Gently brighten skin to reduce dark spots and scars, and regulates oil production. Liquid Oxygen(Perfluorodecalin)- Decreases the look of fine lines and wrinkles by increasing skin’s volume. Due to the mineral content and weight being identical to the human skin and blood - algae is amongst the most compatible ingredients, allowing all layers of the dermis to readily absorb high concentrations of magnesium, potassium, calcium and essential protein chains to plump and boost collagen and firm and prevent wrinkles. Be proactive and preventative - It’s worth every drop - your skin will be left fresh, dewy, and renewed.